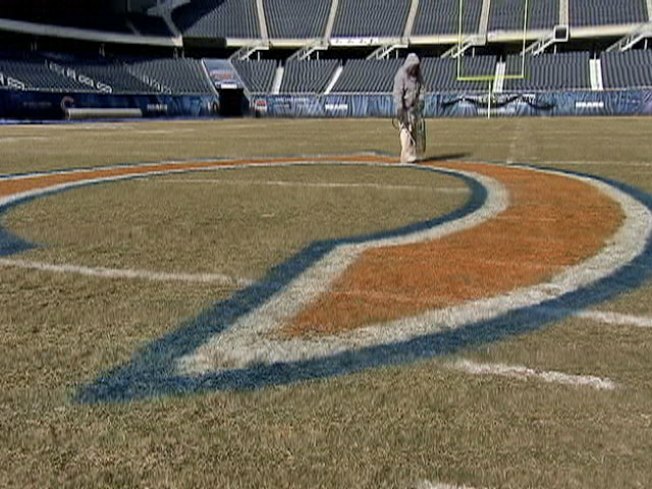 A groundskeeper touches up the paint on the Chicago Bears logo at Soldier Field on Jan. 21, 2011. Last week the Chicago Bears revealed their four opponents for the preseason schedule, but on Friday afternoon the team announced when they will be playing their four games to get ready for the regular season. They will open the preseason schedule on Aug. 13 when they take on the Miami Dolphins at Soldier Field. They will then hit the road for two straight Saturday tilts as they take on the Indianapolis Colts and Cincinnati Bengals, and they will wrap up the preseason on Thursday, Sept. 3 as they battle the Cleveland Browns. Thur., Aug. 13: vs. Miami Dolphins 7:00 p.m. Sat., Aug. 22: at Indianapolis Colts 6:30 p.m. Sat., Aug. 29: at Cincinnati Bengals 6:30 p.m. Thur., Sept. 3: vs. Cleveland Browns 7:00 p.m.
All games will be broadcast on Fox 32 Chicago, according to the team. The NFL will announce the full regular season schedule some time next week.